How much is Smaug's gold from the Hobbit worth ? The Hobbit is a film series based upon the novel The Hobbit by J. R. R. Tolkien. The story is about a hobbit, Bilbo Baggins, during his journey, accompanied by Dwarfs, Elves, Wizards and many other creatures from the Tolkien universe. In the story, a group of dwarfs wants to reclaim the gold of their ancestors. That gold is stored in a fortified mountain, which caves are filled with an immense treasure that once has been stolen from them by a giant fire-spitting and very miser dragon: Smaug. It is in the second and the third movie that we encounter the treasure… and the dragon. My purpose here, in this article, is to estimate the amount worth of gold that we see in the movie (I’m not considering the books). Several scenes in the movie grand us an overview of the gold stored in the mountains. We also see the dragon, and with him, its size and the place he takes in the cave. We also see a room with a “swimming pool” full of molten gold, in which Smaug drowns and Thorin (one of the dwarfs) progresses. The volume of the pool is quite easy to estimate: it’s just a parallelepiped, which size can be found by using Thorins height and Smaugs sizes. The other parts of the treasure will be far more difficult to estimate, but I’ll do my best anyway. I’ll start by found out the size of the dragon, then measuring the swimming-pool of gold. That will give us a start point for the totality of the gold. With successive estimations of the coins, the dragon, the cave, I’ll manage to find out how much gold is in there, and then I’ll estimate its net worth based on the current gold prices. Let’s consider that all the coins have all the same dimensions of 5 cm (~2 inches) in diameter. With gold coins as a reference (5cm / 2 inch) and several pictures from the movies, I deduce that it’s eye measures about 25,9 cm (10 inches), that the distance between his eyes is 3,02 meters (9.9 feet), and his face is 5.23 metes across (17.3 feet). Using that, its body is about trice that size in height. 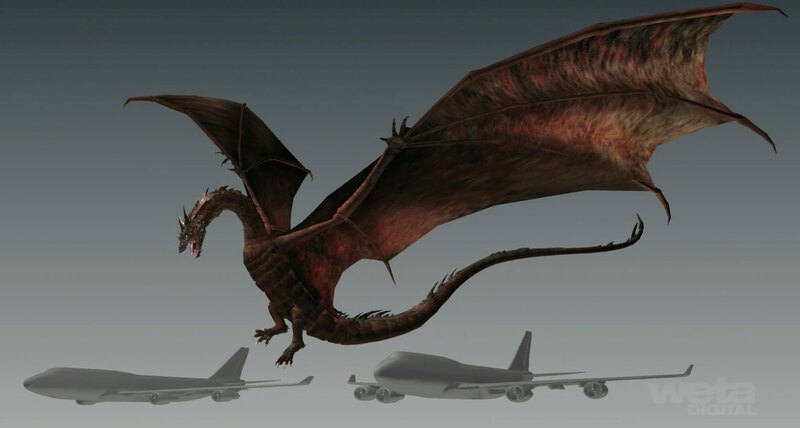 If Smaug was asleep, curled on himself like a sleeping cat, the highest point of its back would be about 15 meters (49 feet) above the floor. This seems huge, but come on: it’s a dragon! Besides, when he destroys the village on the lake, he out-sizes all the buildings, and his wingspan is a good fraction of the whole city. Take this into account and 15 meters (49 feet) seams quite reasonable. In the movie, the dragon totally disappears in the gold. This means that the pool is at least 15 meters (49 feet) deep. Besides, considering the width of Thorin — 1 meter (3 feet) — relative to the pillars, the pool measures roughly 130 meters (426 feet) long and 55 meters wide (180 feet). The total volume of gold in that pool is then 130×55×15 = 107'250 m³ (about 3,78 million cubic feet) . The whole weighing 2'069'925 metric tons! If all this gold was a perfect cube, it would be 47 meters (154 feet) in side. About the same size as two Arc de Triomphe monument, from Paris, side to side. In the real world, all the gold humanity ever extracted since like, forever, would fit “only” in a cube of 20 meters (65 feet) of side. In that pool alone, we already have more than 13 times the worlds amount of gold. The remaining gold is everything that sits in the caves, mainly in the form of coins. It’s quite difficult to estimate all this: these mountains of gold are not uniform and, more importantly, there is empty space between the gold coins. For the mountains of gold, I can estimate a mean size. Smaug, the dragon, sleeps totally under the coins. The hills of gold are at least 15 meters (49 feets) height. At some other places, the floor is visible: there is no gold (0 meters). The hills and the dales are about uniformly spread in the cave, so let’s say that the mean height of the coin layer is about 7.5 meters (25 feet). We now know that Smaug measures roughly 60 meters (200 feet). This is also in accordance with several other estimations (here or here). There is room enough in that cave for about ten Smaugs, in all the directions, according to the different scenes in the movie. We can assume that the cave measures about 500 meters (547 yards) wide and long. Yes, that’s a lot of space! …and a lot of gold too! The volume of gold coins is thus: 7.5 × 500 × 500 = 1'875'000 m³[/b] (66 million cubic feet). But this volume is that of gold coins, not a solid lump of metal. We have to find out how much gold that is and how much air there is in between. To do that, I did the experiment myself: I have a bunch of coins here (not of gold, unfortunately :D). I put the coins in a drinking glass (150 cm³) and filled the space between the coins with water. Then, I drop the coins out and measured how much water remained. thus 70 cm³ of coins. The coins count thus for 46 % of the space. That for, in those 1'875'000 m³ (66 million cubic feet) of coins, there is room for 862'500 m³ (30 million cubic feet) of solid gold. This is as much as 9 Olympic pools filled with solid gold. It would weight 16'646'250 metric tons, and would be worth 676 trillion USD. I don’t know if we can still talk about “wealth” here : if only Smaug was real, it would be 12'000 times richer that Bill Gates. This is ridiculous… He would own 11 times the entire worlds GPD, and would be equivalent to about 70 times the total amount of bank notes and bank coins available in the entire worlds (this amount is called M0), and more than 5 times the total amount of money (coins, notes, bank accounts, virtual money…) on this planet (this is called M3). Smaug is 5 times richer than the entire humanity. Only in gold. We can however mitigate this a little bit. In real life, gold prices go up and down according to demand and supply. If suddenly a huge amount of gold would be added to what we have, gold would be less scarce and its price would go down. Accordingly to previous estimations, Smaug has got a little more than 100 times the world amount of gold. I’m no expert, but considering that, we can divide that price of gold by a factor of 100 as well, and this also goes for his wealth. On the other hand, all that new gold would also generate a new demand and gold prices would go up again. As of today, all our gold tools are tiny because gold is precious and rare. If gold suddenly becomes abundant, we could make everything we wanted out of it and it would no longer be as expensive and rare. Let’s say, a bit haphazardly, that the prices would go down a hundred times first and then go up four times, as new demands kicks in. For years now, Forbes magazine famously ranks the worlds wealthiest people in the world. They also set up the same ranking (for humoristic purposes) for fictional creatures. We find Scrooge McDuck, Tony Stark (Iron Man), Bruce Wayne (Batman)… aaand Smaug! In 2013, Smaug was ranked second richest fictional creature, right behind Scrooge McDuck, but ahead of Tony Stark and Bruce Wayne, with 54.1 billion USD. This is still a huge amount of money, but it’s far from my 13'000 billion USD. The difference come from, I guess, that they used the amount of gold as described in the books, not in the film, as I did. I don’t think that I did any miscalculations here. I did however many approximations, but in each cases, even if I had exaggerated 10 times, or even 100 times (which is a very, very large error), Smaug would still be twice are rich as Bill Gates, and that, today, is something only a real dragon, like Smaug, could say.